[M. x soulangeana, M. x veitchii], cv. (Fairweather Gardens Nursery Catalog, Spring 1999). 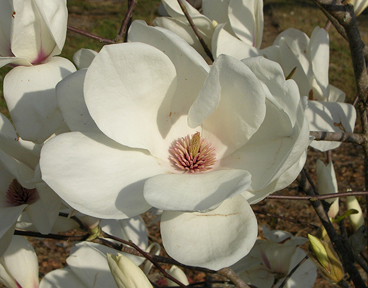 ‘Gorgeous porcelain-white flowers appear in midseason on a nicely-shaped tree. 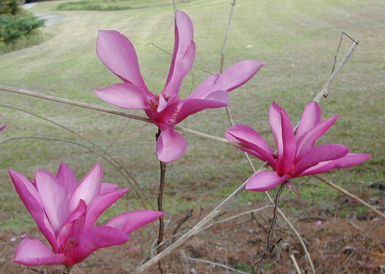 The flowers are unusually thick-petaled and hold well on the tree after they open. 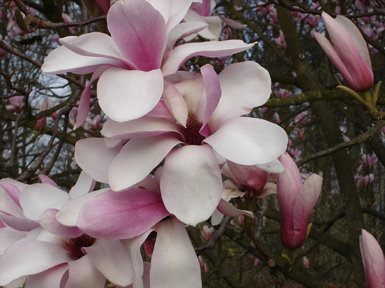 This is a beautiful magnolia (Gresham).’ Syn. : JG#14. [M. acuminata, M. denudata, M. x brooklynensis], cv. (Fairweather Gardens Nursery Catalog, p. 63, Fall 1999). 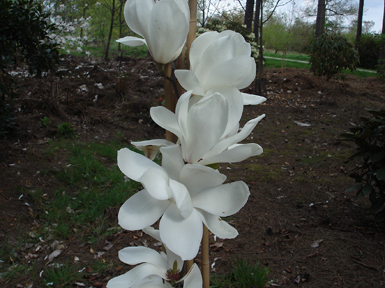 ‘This is Dr. Kehr’s very latest flowering yellow Magnolia. 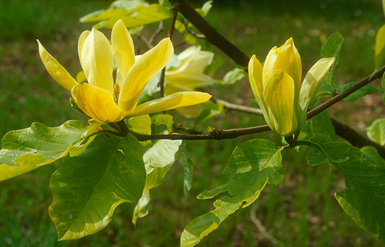 Noted Magnolia breeder, Dr. Frank Galyon, after a visit to Dr. Kehr’s arboretum last spring, declared that this was an excellent Magnolia, perhaps the best yellow that he had seen.’ (M. x brooklynensis cv Woodsman x M. cv Elizabeth). = M. ‘Sunsation’. [M. acuminata], var. - The typical variety. [M. grandiflora], cv. (Page, Page's Prodromus P. 37. 1817, Southampton, England), ‘Tapered’ leaves acuminate. Cultivated at the Southampton Botanic Gardens, Southampton, England in 1817. [M. umbrella], var. (Linnaeus) Parmentier, Bull. Sci. France & Belg. 27: 253, 336 (1896) = M. acuminata. [M. virginiana], var. (Linnaeus, Sp. Pl. 536. 1753) = M. acuminata. [M. x soulangeana], cv. (R. H. Smith, Morris Arb. Bull. 15: 64. 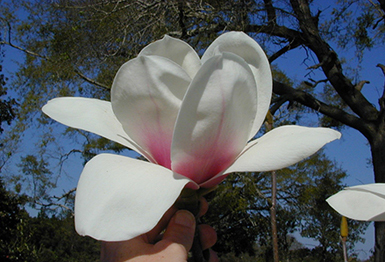 1964), Rather late-blooming, flowers purplish-red outside, whitish inside, tepals 9, each 5 in. long and 2 in. wide, hardy to -10 degrees Fahrenheit. [(M. x soulangeana 'Burgundy') x M. 'Vulcan'] cv. 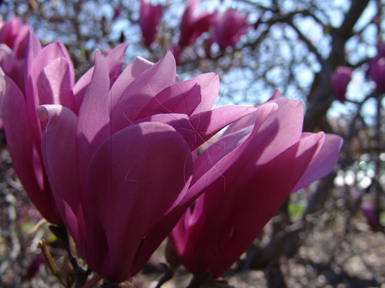 (Magnolia 40(1) [Issue 77]: 13-14, 2005) This upright growing tree produces clean, lilac-purple (RHS 72B blending to 72C), goblet shaped flowers; inner tepals are shaded light pink (RHS 74D); bloom color improves with establishment and humus content in soil; on average 9 tepals are produced, up to 10.7cm (4.2in) long and 9cm (3.54in) wide; may eventually reach 6-8m (20-26ft) tall; predicted to hardy to USDA zone 7; originated at Duncan & Davies Nurseries of New Plymouth, Taranaki, New Zealand, selected and named by Vance Hooper, and registered on February 4, 2004 by Jim Rumbal. [M. campbellii], cv. 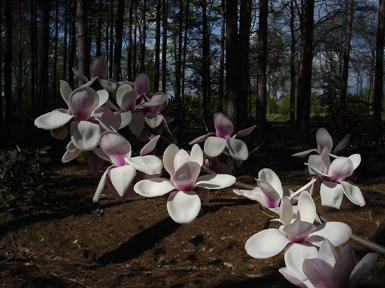 (Eric Walther, circa 1961, Strybing Arboretum, San Francisco, California). Name not published, unregistered. = cv. Late Pink. [M. grandiflora], cv. (J. C. McDaniel, Cullman, Alabama, 1930). In Proc. Central States Forest Tree Improvement Conference 6: p. 7 (October 1968), ‘...selected...at Cullman, Alabama, where it usually continued flowering into September and sometimes later. 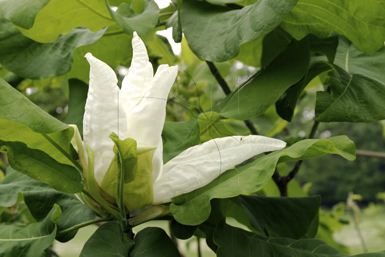 It has particularly fragrant flowers.’ growth is vigorous, leaves lance-shaped, flowering season long. Originally called cv. Alabama. [M. acuminata], var. (Ashe, Torreya 31: 370 1931), twigs pubescent, leaves soft-pubescent. Sometimes pale beneath, flowers 7-9 cm. long, green or yellowish-green, habitat: Choctaw and Tuscaloosa counties, Alabama. = M. cordata. [M. campbellii], var. (Roy. Hort. Soc., Camellias and Magnolias, Conference Report, p. 106. 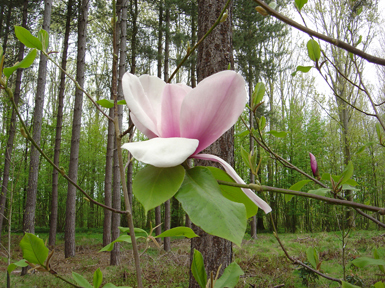 1950), flowered for first time since 1939. Findlay, Jour. Roy. Hort. Soc. 77: 46 (1952), nomen nudum. var. alba Hort. in Hilliers Man. of Trees and Shrubs, Ed. 2. 1973. [M. speciosa], cv. (F. & F. Nurseries, cat. p. 45. 1942, Springfield, New Jersey), ‘Except for a purple stained stripe on the outside the numerous flowers are white. Grows vigorously but neatly.’ Probably = M. x soulangeana cv. Alba. [M. x soulangeana], cv. (Louis Van Houtte, about 1867), See Wister, Swarthmore Plant Notes, ed. 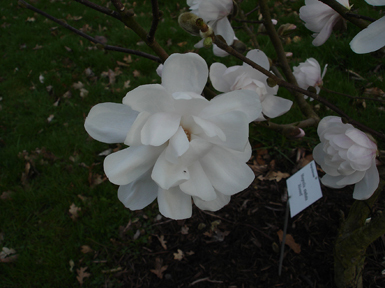 3, 1 (1): 86 (1955-56), ‘Classed as white and effect of tree is white, but outside of petals faintly tinged light purplish rose, darker in veins. Color extends less than halfway up petal. Inside a little purple at base, not on petal. 9 petals; 3 x 1-l.5. Tree fairly tall, well balanced, thickly compact.’ syn. : cv. Alba Superba and cv. Alba Spectabilis. [M. x veitchii], cv. (Pearce, Jour. Roy. Hort. Soc. 84: 422. 1959), flowers white. [M. x soulangeana], cv. (van Houtte, cat. #163: 45. 1875, Ghent, Belgium), As M. (purpureo/yulan) Alba Spectabilis, nomen nudum. in Beissner et al., Handb. Laubholz-Benennung 99 (1903), as M. obovata f. Alba Spectabilis. Probably = cv. Alba. [M. denudata], cv. (Pampanini, Bull. Soc. Tosc. Ort, 40: 1990 1915), Flowers large, white, very late blooming. M. x soulangeana cv. Alba or cv. Alba Superba. [M. x soulangeana], cv. (van Geert, Extr. Gen. cat. pl. p. 22. 1866, Ghent, Belgium), As M. Alba Superba, nomen nudum. in Van Geert, CAT. #71: 112 (1874), As M. yulan cv. Alba Superba, nomen nudum. In Graebener, Mitt. Deutsch. Dendr. Ges. 14: 37 (1905), as M. Alba Superba. Flowers white, close to (M). yulan. in Gardening Illustrated 33: 449 (1911). In Bailey, Stand. Cycl. Hort. 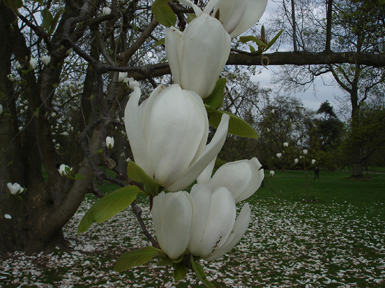 4: 1969 (1916), ‘white.’ In Millais, Magnolias 54, 79 (1927), Flowers creamy-white, flowering 10-14 days after M. denudata. probably = cv. Alba. [M. x soulangeana], cv. (Kelsey & Dayton, Stand. Pl. Names, Ed. 2, P. 377. 1942). = cv. Alexandrina. [M. x soulangeana], cv. (Overlook Nurseries, catalog 1954-55, Mobile, Alabama), In Domoto, Jour. Calif. Hort. Soc. 23: 45 (1962). = cv. Alexandrina Alba. [M. x soulangeana], cv. (Wister, Swarthmore Plant Notes 1: 57. 1943), also in Ed. 3, 1 (1): 88 (1955-56), nomen nudum. Not distinct. Sawada. Natl. Hort. Mag. 29: 55 (1950), Flowers more white than cv. Alexandrina. M. alexandrina var. 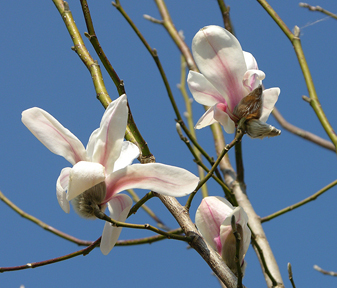 Alba in Millais, Magnolias 82 (1927), branches erect, flowers larger and whiter than cv. Alexandrina, essentially white flushed rose outside, blooms one week later, petals 4 1/2 in. long, 2 1/2 in. wide, shaded purple at base. Valuable for its late blooming. [M. x soulangeana], cv. (Schelle in Beissner et al., Handbuch der Laubholz-Benennung 100. 1903), nomen nudum. Given as M. alexandrina f. variegata. Per Pampanini, Bull. Soc. Tosc. Ort. 40: 214 (1915), leaves variegated cream (white-yellow), was obtained in Holland from Walraad in 1893. [M. denudata], cv. (Pampanini, Bull. Soc. Tosc. Ort. 40: 199. 1915), petals patent, outside purplish, inside white. Probably = M. x soulangeana cv. Amabilis. [M. x soulangeana], cv. (Gossler, Plant List 1971, Springfield, Oregon), ‘Resembles (M). denudata in habit, flowers large, almost pure white.’ = either cv. Alba or cv. Amabilis. [M. x soulangeana], cv. (W. B. Clarke & Co., list 5859, p. 50. 1958, San Jose, California). A misspelling for cv. Amabilis. [(M. x brooklynensis 'Evamaria') x (M. x brooklynensis #143)] cv. (Magnolia 40(1) [Issue 77]: 14-15, 2005) This hybrid possesses a vigorous, pyramidal habit and is expected to mature at 7-10m (33ft); flowers are multi-colored; tepals are barium yellow (RHS 10C), shaded with chartreuse green (RHS 154C) and with beet-root purple (RHS 72A) striping and stippling on the center; outer tepals are shaded at the base with citron-green-bronze (RHS 152D), and inner surfaces are a creamy barium yellow (RHS 10D); the six oval and persistently cupped tepals are up to 11.5cm (4.5in) long and 6.3cm (2.5in) wide; flowers emerge slightly ahead of or with the new shoots; predicted hardy to USDA zone 6; selected by David Cullow in 1998, registered by Jim Rumbal on February 4, 2004. [M. x soulangeana], cv. (Botanic Garden, Copenhagen, Denmark, 1962), Name used for a plant in cultivation. This may = cv. Andre Leroy. [M. grandiflora], cv. (Leroy, Rev. Hort. 37: 308. 1866), Grown by Mr. Bodin of the Isle of Jersey. Leaves oval, vivid green above, reddish brown beneath, flowers dull white, large, to 30 cm. in diameter, tepals very thick and fleshy. blooms the entire summer. See Leroy, catalogue p. 65 (1856), given as cv. Macrantha Anglorum. Also see Koch, Dendrologie 1: 368 (1869). Probably = cv. Englica. [M. grandiflora], cv. (Cels, cat. Arb. p. 230 1817, Paris, France), as M. angustifolia, per Pampanini, Bull. Soc. Tosc. Ort. 41: 77 (1916), leaves narrowly acuminate. Grown in 1825 at Angers, France. See Loudon, Arb. Frut. Brit. 1: 261 (1838). Leroy, cat. p. 79 (1873), Angers, France; ‘leaves narrow.’ See Hilliers Man. of Trees and Shrubs, Ed. 2. 1973. ‘Flowers typical.’ Compare with cv. salicifolia and with cv. Hartwegus. [M. virginiana], cv. (Page, Page's Prodr. p. 21. 1817, Southampton, England), as M. glauca cv. Angustifolia. ‘Willow-leaved.’ See cv. salicifolia (Bosse, 1841), with similar description. [M. grandiflora], cv. (Schelle in Beissner et al., handb. Der Laubholz-Benennung 100, 1903), nomen nudum. [M. acuminata x M. 'Elizabeth'] cv. 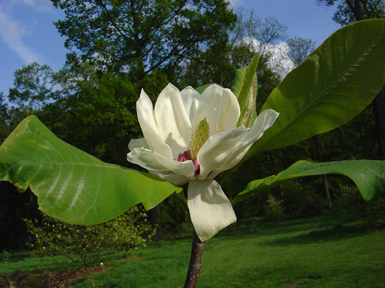 (Magnolia 40(1) [Issue 77]: 20-21, 2005) This upright tree bears erect flowers that open with the leaves; outer tepals have green shades but are not sepaloid; young flowers are very green (RHS 143C), depending on stage; mature flowers are deep yellow (RHS 7D) on the outside and sulphur yellow (RHS 6D) within; outer whorl of tepals has a green blotch; tepals are broadly obovate and 10-12cm (3.94-4.72in) long and 5.5cm (2.16in) wide; stamens are yellow with soft pinkish filaments; gynoecium is green with soft yellow stigmas; bloom period is longer than a month; hybridized by Dr. August Kehr, raised, selected, named and registered (November 9, 2004) by Koen Camelbeke and Philippe de Spoelberch of Arboretum Wespelaar, Belgium. Name and description of this plant previously published by Camelbeke, K. 2004 Jaarboek Belgische Dendrologische Vereniging 2003:40. [M. liliiflora, M. stellata], cv. (Dudley & Kosar, Morris Arb. Bull. 19: 28, Figs. 1, 4. 1968), Early blooming, flowers small, 2-4 in. in diameter, buds red-purple (RHS 71A) at the base to (RHS 70B) at the apex, flowers erect at anthesis, tepals 6-8, subulate-obovate, 1-2 1/2 in. long, 1/2-3/4 in. wide, erect, outside red-purple (RHS 71B) to purple (RHS75A-75D), inside purple (RHS75D), stamens 50-60, red-purple (RHS 71A-71B). A sterile triploid. U. S. Natl. Arb. #28344. (M. liliiflora cv. Nigra x M. stellata). [M. grandiflora], cv. 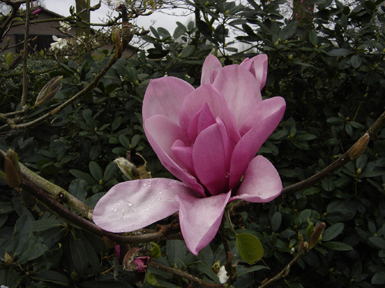 (Pickard, Magnolia Gardens, Canterbury, Kent, England), Name registered 31 Dec. 1968. First propagated in 1964 from cv. Saint George. described as being identical to cv. 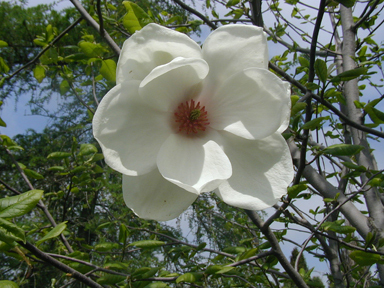 Saint George, but with leaves variegated, flowers fragrant, creamy-white, with 22-25 tepals; has withstood -27 degrees C. (-15 degrees F.); may be grafted or budded onto M. kobus. [open pollinated M. cylindrica>], cv. 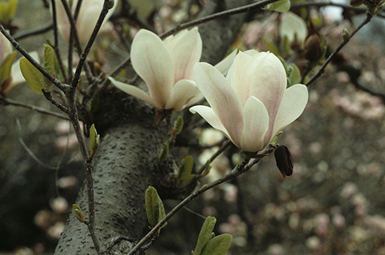 (Magnolia 35(2) [Issue 68]: 15, 2000) This vigorous tree has a habit and general appearance similar to �Albatross�; large flowers up to 25.5cm (10in) across are produced early in season; grown, selected (1990) and registered (1999) by Dr. August Kehr; previously known as M. cylindrica Kehr Form and #3-18 in Dr. Kehr�s collection. [M. liliiflora], cv. (Mouillefert, Traite 120. 1891), as M. purpurea var. arborea: More robust than the type, very prettily borne. Leaves a little smaller, reddish, rusty in the upper half and very pubescent, shoots of 2 years red-brown. 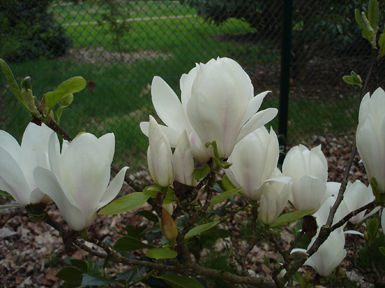 Cultivated at Trianon near Paris, syn. : M. arborea (Hort. ex Pampanini, Bull. Soc. Tosc. Ort. 41: 138. 1916), AS M. liliiflora var. [M. stellata], cv. (Wada, Jap. Gard. Treas. p. 36, Hakoneya Nurseries, Numazu-Shi, Japan), ‘A hybrid with M. kobus.’ = M. x loebneri. [M. virginiana], cv. (Loddiges, Catalogue, Ed. 11, p. 29, Appended to His Bot. Cab. 1. 1818), as M. glauca arborea, nomen nudum. It is cited by Mouillefert, Traite 113 (1891), as not very notable. [M. kobus], cv. (cultivated in 1961 by D. Todd Gresham, Santa Cruz, California and David G. Leach, Brookville, Pennsylvania), In reply to the questionnaire sent by John M. Fogg, Jr. This may = var. borealis, which is arborescent. [M. virginiana], cv. (Pursh ex de Candolle, Reg. Veg. Syst. 1: 452. 1817), As M. glauca var. argentea. Leaves oblong, glaucous white silky hairy beneath. Probably = var. australis. [M. acuminata subsp. subcordata], cv. (Treseder's Nurseries Catalog, p. 2, circa 1965, Truro, Cornwall, England), nomen nudum. [M. grandiflora], cv. (Hort. ex Pampanini, Bull. Soc. Tosc. Ort.41: 78. 1916), per Synonymy = cv. Exmouth. [M. liliiflora], cv. (Pampanini, Bull. Soc. Tosc. Ort, 41: 138. 1916). Probably = M. liliiflora cv. Nigra. [M. x soulangeana], cv. (Hort. ex Pampanini, Bull. Soc. Tosc. Ort.41: 139. 1916), In Synonymy = M. liliiflora cv. Nigra. [M. grandiflora], cv. (SIC) Millais, Magnolias 83. 1927), error in Spelling = cv. angustifolia. [M. acuminata], F. (Ashe) Hardin, Jour. Elisha Mitchell Soc. 70 (2): 306. 1954). Basionym: Tulipastrum acuminatum aureum (Ashe, Bull. Charleston Mus. 13: 289. 1917). [M. acuminata], var. (Nicholson, The Garden 24: 512. 1883), leaves golden streaked green. syn. : M. acuminata var. variegata (Per Bean, Trees & Shrubs 2: 67. 1914) (Not Ellwanger & Barry). [M. auriculata], var. - The typical variety = M. fraseri. [M. australis], var. - The typical variety = M. virginiana var. australis. [M. virginiana], var. (Sargent, Bot. Gaz. 67: 231. 1919). ‘Differing from the type in the white silky pubescence on the pedicels and branchlets. Leaves remaining on the branches until spring without change of color.’ The type is from Louisiana. syn. : M. australis (Sargent) Ashe, Torreya 31: 39 (1931). Probably = var. longifolia, which has priority in usage.